Here's the funny thing about writing - you just never know who is going to be reading what you've written. In addition, you never know who is going to make a comment - as Yours Truly found out when I wrote a certain article about Danielle de Niese. In 130 years, you'd think the Metropolitan Opera had covered the significant repertory. 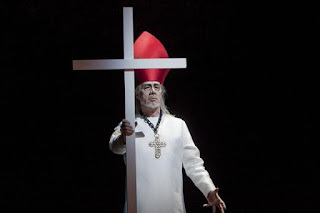 But not until last month, 164 years after its Venice premiere, did Verdi's Attila reach the MET. And it came with some starry names. The sets were by Swiss architects Jacques Herzog and Pierre de Meuron, who have some Texas notoriety: Picked to expand Austin's Blanton Museum of Art, they withdrew in 1999 ... international outrage ensued. Costumes were by fashion maven Miuccia Prada. The conductor was Riccardo Muti, in his own belated Met debut. It's hard to defend Verdi's opera about the head of the Huns as great music. The vocal writing is pretty formulaic, and at this early stage in his career Verdi had exactly three devices for accompaniment: insistent pulsings, arpeggios and oompahs. The opera can be salvaged, sort of, by great singers, and by a director with real imagination. At the MET, it has, well, one of the former. At Saturday's matinee reprise, Violeta Urmana, portraying the Roman princess Odabella, was announced as suffering from a cold ... ever thereafter, she sang and acted with a passion and expressiveness scarcely suggested by either her friends or foes. ... Known for buildings of elegant finesse, [set designers] Herzog and de Meuron supplied a first-act pile of concrete slabs and rebar that looked like the aftermath of an earthquake. Scenes in the woods were set beneath, and in holes within, a wall of vegetation as dense as a tropical jungle. (The opera's setting, remember, is fifth-century Italy.) The chorus sang stirringly, but lined up downstage like half-buried Qin Dynasty warriors. Muti and the orchestra made all that could be made of the score. Pierre Audi, who has some prominence in Europe, was listed as director, but there was little evidence of directorial concept – or, frankly, anything but the most obvious interactions among the dramatis personae. The Prada costumes made much of crinkly dark crepe and what looked like Naugahyde. But the gold duds for the aborted Attila-Odabella wedding dazzled. Now, as we all know, the MET is doing all sorts of "new and exciting" things this season - like the Luc Bondy Tosca for instance [pause for sighs of annoyance]. No matter the issues at the MET, we very rarely hear comments about productions from singers - and if we do, it's usually from a singer who is flapping their jaws just to get the publicity. It is unfortunate that for the Met's first production of ATTILA they could not do a more "conventional" production. The sets and the costumes had nothing to do with the period of the opera or the characters. I know from having been at rehearsals that the director gave the singers nothing and the set prevented them from doing anything dramatically. The production is a fiasco! Samuel Ramey(I was the Pope). I'm sorry - but that made me howl in an inappropriately loud manner - Samuel Ramey (I was the Pope). I love it. Now, isn't it easy enough in this day and age for someone to pose as Mr. Ramey - saying whatever they want under his name? Potentially. Except for these little details: Mr. Ramey posted the comment under an aol.com email address. I happen to know, having corresponded with Mr. Ramey years ago while preparing to sing Rev. Blitch in Floyd's Susannah, that this is indeed his email address. In addition, our dearest La Cieca received an email from Mr. Ramey confirming that he did, in fact, make the comment. I should add that musically it was incredible. Muti truly loves the early Verdi operas and, especially, ATTILA. I know from experience as I recorded the opera with him and performed it with him at La Scala almost 20 years ago(the title part). Here's what: there *are* still some singers out there who recognize, even where the MET is concerned, that sometimes you have to make your opinion known - and not just for the sake of publicity, but because you actually stand for artistic integrity. 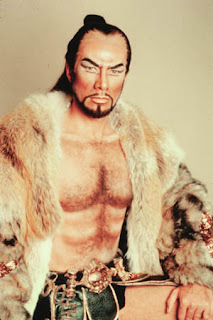 I'm sickened by all the discussion of Samuel Ramey's comments about the production of Attila in which he is appearing currently at the Met. Mr. Ramey is a brilliant singer (even with that "slow vibrato"), who has entertained millions with his voice. I've heard him in person numerous times, even arriving at the performances after long, tiring trips. The scenario for one went as follows: Get up at 6 AM, drive for twelve hours from San Diego to San Francisco in the pouring rain, arrive at hotel which was beautiful and elegant a few years previous, find out hotel is now not suitable for human habitation, drive in pouring rain for 45 minutes to hotel in Palo Alto, sleep for a few hours, get up and take expensive cab ride into San Francisco as opera house doesn't have parking, see Mr. Ramey in Boris Godunov, take cab back to hotel, sleep for a few hours, get up at 6 AM and drive back to San Diego. Was it worth the hassle? You bet...a thousand time over. Would I do it again? In a heartbeat. I'll go hear Mr. Ramey anytime he appears within driving distance. I once went to Las Vegas just to hear him in concert with the UNLV orchestra. Drove out one day and came back the next. The man is the finest bass-baritone of the 20th century. He's earned the right to speak his mind. He also appears to be a fine gentleman. I've never heard an unkind word about him...until all this hoopla over his comments on the Attila production. Mr. Ramey, you're the best, always will be.